KT-Bolt takes pride in offering the best quality products and timely service while offering competitive pricing. We specialize in hot forging of high temperature and corrosion resistant stainless fasteners. 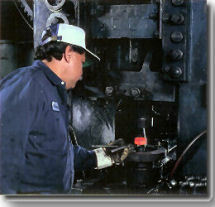 Bolt Manufacturing - K-T Bolt has an extensive assortment of standard and custom bolts. Electro-Polishing - When a design requires a metal finish that demands a smoothness that cannot be obtained by mechanical means. KT Galvanizing - Superior protection for for all your mechanical products. On-site Testing - Onsite accredited and FAQ compliant fastener testing services. K-T Bolt Manufacturing Inc. provides our customers with solutions backed by over (37) years of fastening experience in solving complex bolting issues. Prototype Specials per Customer Blueprints . . . Call if your material requirement is not listed. Call if your specification requirements are not listed.